Yesterday, after church we wanted to do something outdoors (again) since the weather was spectacular (again), so we did a bit of an urban adventure. We took the ferry to Devonport, walked up North Head for the amazing view over Auckland's harbour and the Hauraki Gulf, and watched a documentary there about the project to eradicate predators from Rangitoto and Motutapu islands (which is now complete!). 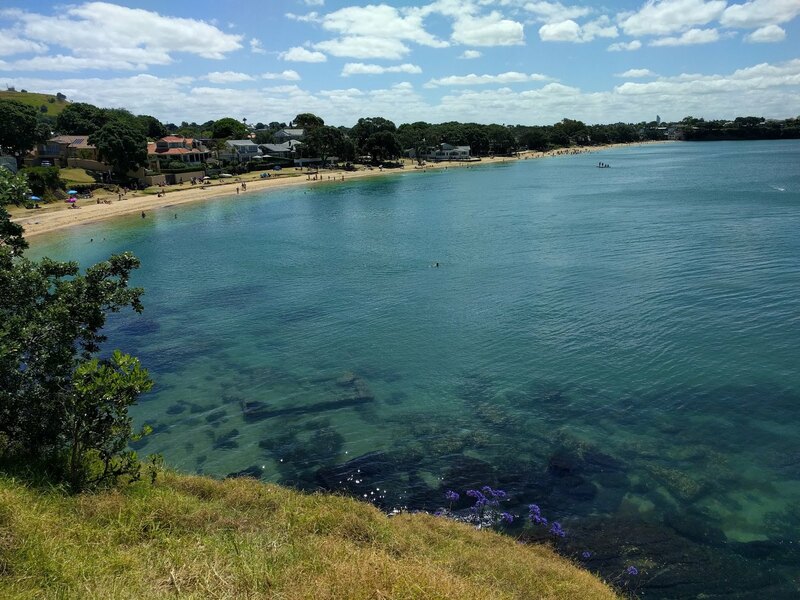 Then we walked to Takapuna via Cheltenham, Narrow Neck and Takapuna beaches. Between beaches we could have walked around the rocky foreshore since the tide was far out, but to save time we took the streets instead. We reached Takapuna around dusk, rewarded the kids (and me) with ice-creams and took the bus back to the city, where we had Korean food at Nol Bu Ne restaurant. That place is really good --- cheap, tasty, and filling.